As I have been going about my daily business, running errands, shop for groceries, etc I cannot help but notice all the Xmas trees up for sale. While I don’t celebrate Xmas, many of my clients do and to them this is a special time of the year. Even I find the early darkness, the short days, the warm lights, the warm wine, the lit fireplaces such a wonderful thing. I love the sight of tiny lights strung around window frames, the twinkle of the lights in the Xmas trees visible through the windows. I love the street decorations and for a short while I even love the Xmas carols in the stores, although that only lasts a few days until they drive me bonkers. Too many too often too long. Here are some creative interpretations of the traditional Xmas tree to show you the wonderful things people come up with. It is quite interesting. While a real tree, tall and lush, is a sight to behold, it is probably not the best idea to keep cutting trees for this single purpose only to be made into mulch a few weeks later. Faux trees leave a carbon footprint which is also not desirable. You would have to keep the tree a minimum of 8 years but preferably 20 years to fully offset its footprint. Probably not the best idea either. In some provinces in Canada you can now actually rent a real Xmas tree for the holidays. It comes potted and you return it to be put back in the ground after the holidays. Now that is a splendid idea. How about being a bit more creative? Alternatives are becoming quite popular. They look festive and interesting and now that so many people live in much smaller homes, these alternatives are easier to place and store. Or you can make a new one each year. Little material is necessary and some time and sweat equity. So lets take a look at some interesting Xmas ‘trees’. Brace yourself: there are quite a few. People are so creative and inventive! Just wonderful. Have a piece of plywood laying around in the garage? 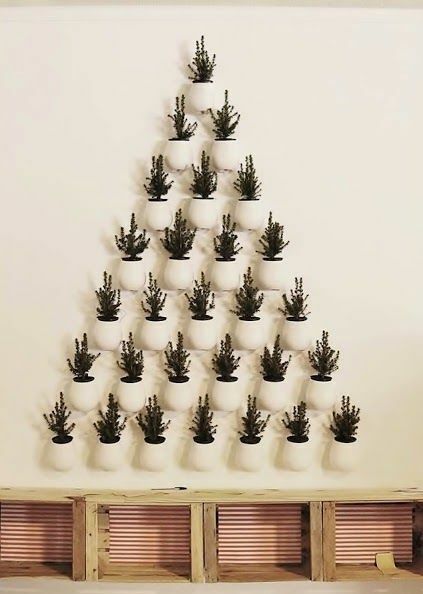 Stand it up against a wall, add lights in the form of a tree and you are so done! Or what about an old pallet? Clean it up and paint a tree on it. Hang decorations and lights from it and it too is done. Now, the German Town or the Painted Plywood trees below require some serious finesse. You have to know how to operate a saw and cut out the details. Great effect though, especially with the lights behind it. Paper is plentiful and readily available at little cost. 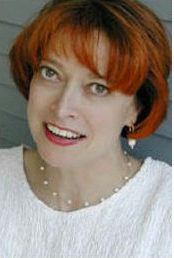 In the first image the twine tree with ornaments is displayed on a piece of angled wall paper. Your local paint or decor store may well have a left-over piece you can take home with you. Choose a neutral or colourful one and decorate it with coordinating coloured ornaments. The second image is really only a number of 8.5x11 inches blank writing paper with a date on it. Held together with clothespins which have been mounted to a black piece of plywood with a hot glue gun. After each day passes you can attach an ornament to it with the clothespin. Easy! Any of these two trees can be scaled up or down. You can choose the colours you like best and you are set to go. Hah, isn’t the Post-It-Note tree a clever idea! Almost an afterthought, but it works though.The tree made up from gift boxes gives it a dimensional look. You can even place gifts in the boxes rather than using the traditional stockings and stuffers. I like how the Vintage Hymn Tree is contained by the twine defining the shape of the papers and giving it a base. The rustic environment helps to make this structure stand out. Have lots of old books laying around in multiple sizes, stack them up to form a tree. Hold the structure in place with lights strung around it. Just make sure the lights are not too hot to set fire to the books! 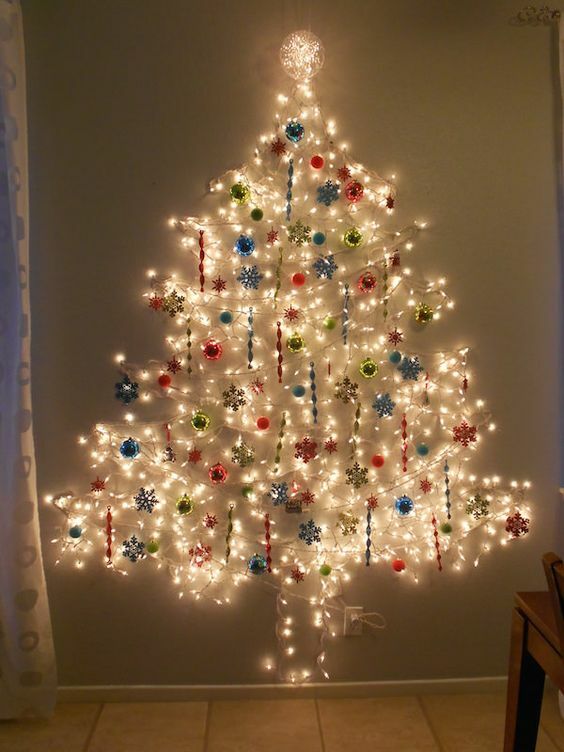 Simple felt circles in a myriad of colours and stuck to the wall with double sided tape also make for a fun tree. Note how they have added packages at the bottom to anchor the tree. Adding lights would make it cozy in the evening. I also like the photo album tree (if only those annoying lights would not flash as quickly as they do in this photo). You can select your favourite family photos and reminisce with the family over dinner. While the trees below are small in scale they can easily be scaled up to any height. All of them are made of felt, which is available by the yard. With a broom stick, a plant pot full of soil any of the standing trees can be made larger. Add wire for support and to keep the tree rigid. The multiple felt leaf trees will require a wire frame to hang the leafs from. 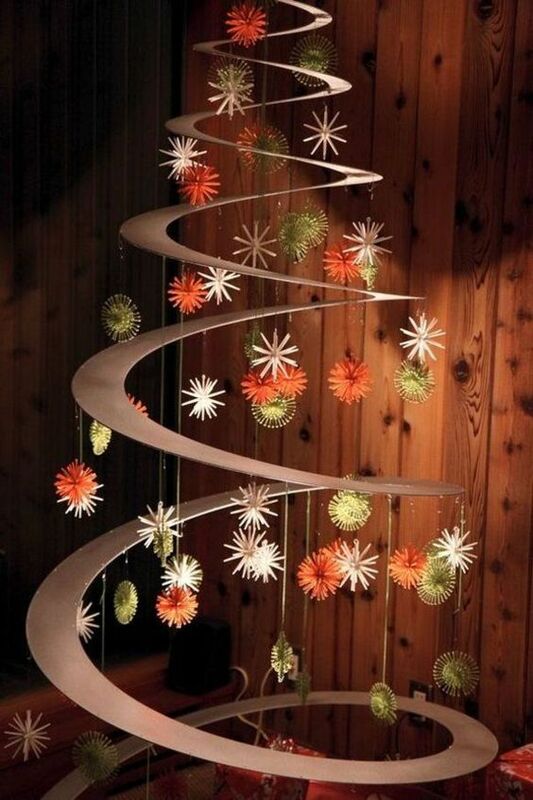 For the red tree, which could be suspended from the ceiling, cut a strip of felt and fold it as shown in the image. Tack the folds in place or use a hot glue gun. As you can see from these images, Xmas trees do not have to be green at all. Really, any colour will work as long as it coordinates with your decor. Some years back Ikea came out with a fabric showing a printed tree. I don’t know if they still do, but it looks pretty cool. It could be copied. Have a photo of a tree transferred to a piece of canvass. Add a casing with rod at the top and bottom to give it structure, then add your own ornaments to the fabric and suspend it from the ceiling or wall. Super easy and effective. Storage is not a problem either. You just fold it up for next year. Contemporary interiors will welcome any of the two trees below. Simple and pretty. Easily adaptable to a new theme each year. In the image below a picture frame has been used to glue ornaments in the form of a tree. The size of the frame shows the tree really well. I would like it even better by using a large framed mirror. Attach the ornaments to the mirror directly with double sided tape. 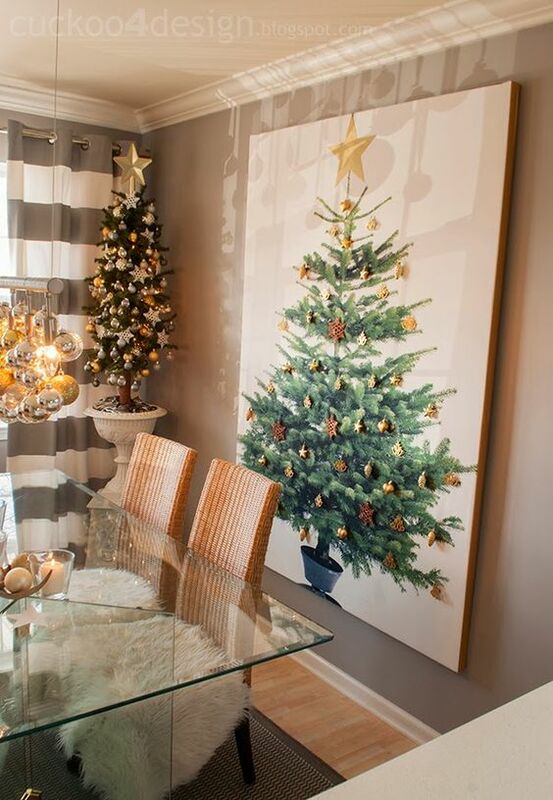 The mirror behind the tree will enhance it dramatically. You would not even need a huge mirror to do this. Most of us have an old wood stepladder hanging around somewhere I suspect. Why not pull it out, shine it up and decorate it to make it look like a Xmas tree. The charm is in the wood ladder. A regular metal stepladder would not quite give the same effect. Check out the examples below. Stressfree tree decorating if you ask me. It is quite popular in some European countries to set up miniature winter villages to decorate for the holidays. I can’t speak for North America since I have not seen any of those here. If you are into that, setting it up on a stepladder is a great idea! The added lights give the display that winter glow. Source: Nordic Designs A simple but effective set up. Quite moody, lots of ambience. Hanging a tree like structure from the ceiling can be quite effective as well. It also frees up floor space which in turn can be used to place the gifts. Since we are ground-bound creatures we typically use floor space much more than any space higher up. Unless you have cabinetry or bookcases going up to the ceiling, lots of space there is unused. 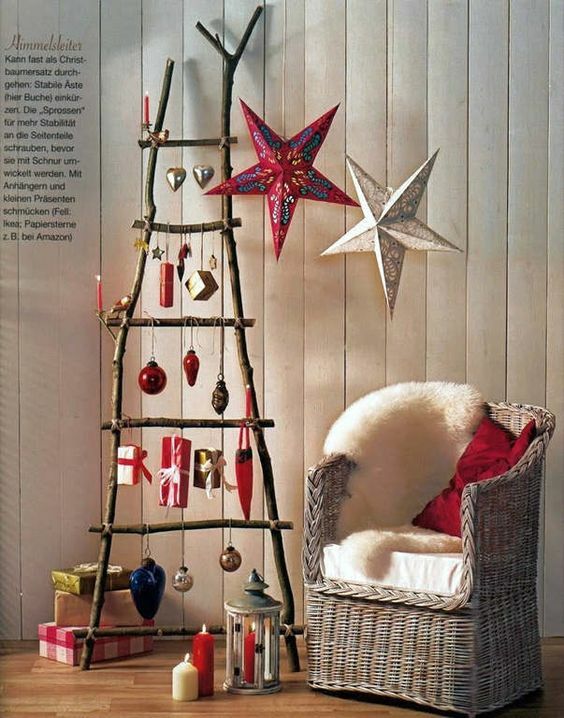 By suspending a tree you can use that space more efficiently. For those of us who are too busy to give any thought to decorating and who are last-minute people here are a couple if solutions. They cost very little and take little time to do. The first image shows a German solution: antler decals form the tree branches. Easy to peel off after the season is over. Effective, no?! Image number two makes me smile. So simple, so quick to do. You will have to repaint the wall afterwards though unless you use a tape to get the outline of the branches. 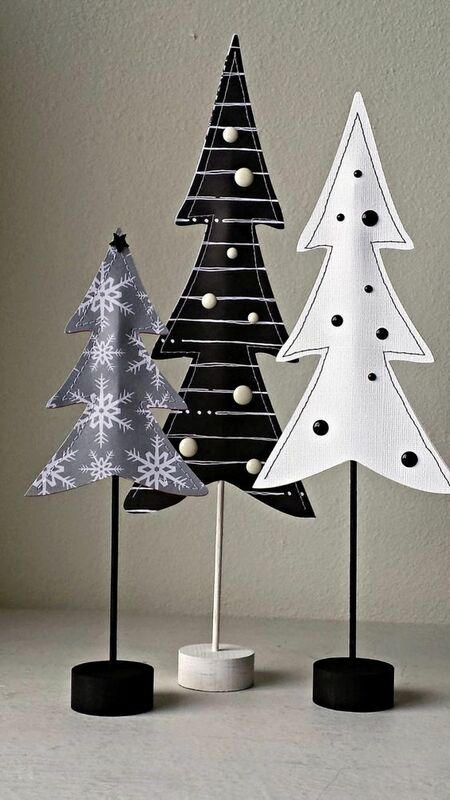 As you can see anything that can be made in the outline of a typical Xmas tree can be used: twine, lights, twigs, branches, potted plants, ornaments by themselves and even painted egg cartons (mind you it will require saving a lot of cartons over the years -yes plural- and then painting them!). Anyway, you get the idea I’m sure. Some people decorate their trees with a theme in mind. This could be anything of course: music, angels, dolls, cars, stars and planets, etc. The possibilities are endless. My friend Doeshka often had a South American theme with ornaments made of straw and yarn. But, what really caught my interest though is a Japanese decoration called Koma. Japanese Komas in embroidery floss. A Koma is actually a Japanese toy. We call it a top. Like tops, Komas are available in wood, plastic, paper and as candy. They are also used as decoration. The cover image of this article shows a Koma made by Jennifer Miner. 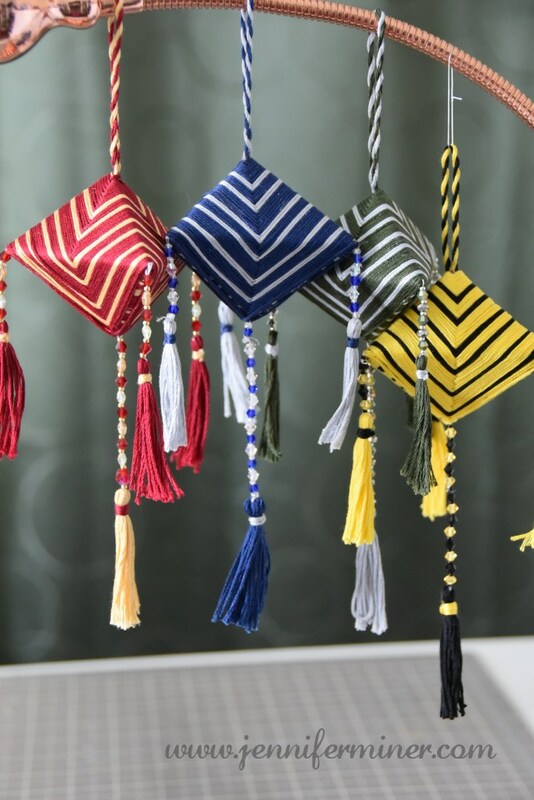 She makes them from cardboard and embroidery floss, with tassels at the bottom where ordinarily the spin point would be. It is the embroidery floss which gives the ornaments such a lustre and sheen. A tree full of Komas would be wonderful. 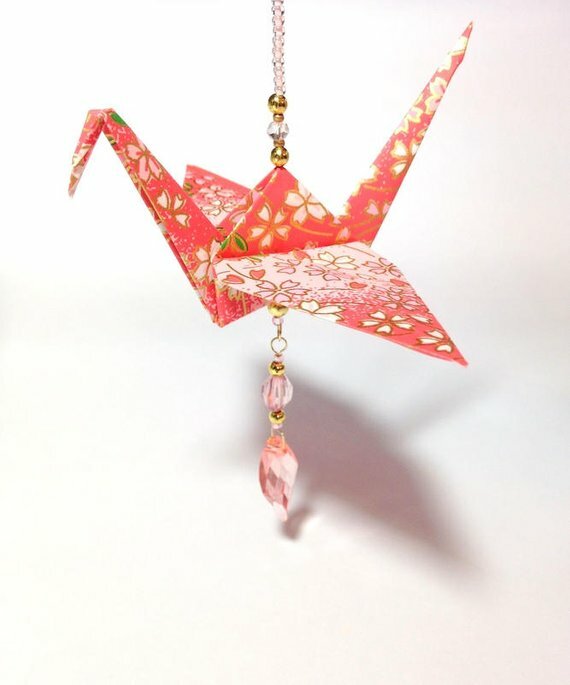 Mix it up with origami cranes and paper fans and you have a Japanese tree. Lot of work, but worth it. A Koma would also be a good hostess gift. Mmmmm, I might make a few myself and will let you know how they turned out. Regardless, any of the trees above can be done with these decorations in mind. Loads of ideas, right? Hope you enjoyed it and as always, thank you for the visit. Have a great holiday season whatever you celebrate. Enjoy time with family and friends. Since ultimately that is what matters. Note: nearly all images were found on Pinterest. Proper creditation for artwork and images was not always available.